One of the oldest clubs in the world Rickmansworth was founded the same year as the Marylebone Cricket Club (MCC) and also the same year as the founding of Australia as a nation - 1787. From 1787 to around 1800 Rickmansworth played Cricket at a ground just at the bottom of the Hill where Rickmansworth Golf Club is now and near the White Bear Pub. There are brief references in the press of a match having been played by the Club at Pinner in 1760 and then again in 1790, and also of some information in the Uxbridge pavilion of a match in the early 1780's. There are, however, no documents supporting these references so 1787 is the agreed date. In 1803, Rickmansworth hosted its only first class game during the 1803 English domestic season. View the scorecard. Note the key player in the match was Lord Frederick Beauclerk. He was a descendant of King Charles II and his mistress Nell Gwynn, one of the best single-wicket cricketers of his time. His under-arm bowling was very slow, but extremely accurate - and he could get the ball to rise abruptly off a length. Lord Frederick was the second president of MCC in 1826. A local guide circulated in Rickmansworth about 1912 contained an article by Mr Tom Bevan, the Headmaster of the Boys Elementary School from about 1890, giving details of some of his researches at Lords. In this article it is stated that the Rickmansworth Club played an England team at the Lords ground in 1807 - that is before the battle of Waterloo. It is believed that In the middle of the 19th century the club moved to its present ground which at the time belonged to the local landowner who lived at Rickmansworth Park House. This was a substantial Georgian property located just above where the girls Masonic school stands today. The Ground was generally used by the workers from the local Salters Brewery, mainly for cricket but also other pastimes such as athletics. Eventually the brewery took possession of the ground from the estate of the main house. By the end of the Great War the main house was falling into disrepair and the main part of the grounds - 204 acres, were purchased by the Masonic organisation for the consolidation of their girls schools. The cricket ground was bought by a local philanthropist who gave the grounds in perpetuity to the cricket club providing sports should always be played upon them. Originally there was a wooden pavilion which provided accommodation only for serving refreshments and for teams to change their attire. There were no storage facilities for documents, and consequently no records, other than a score book dated 1881-3, have been preserved. In this score book, in addition to details of matches played against several clubs, including Abbots Langley and Pinner, there are details of a match with an England team. The overs were 4 ball overs at the time and teams rarely scored more than 100 and often batted twice in a day. The late Mr FBH (Frank) Goodyear, a member and office of the club for some seventy years or more, remembered the celebrations held at the Club in 1897 to commemorate Queen Victoria's Diamond Jubilee. "The celebrations concerning this event were held on the cricket ground and in the adjacent Rickmansworth Park. On that occasion a portion of the fence separating the properties was removed near the position of the old pavilion to allow the public to circulate. "The cricket ground was actually the property of Salters Brewery, which was situated on both sides of the road near where the Joan of Arc Roman Catholic School now stands. Access to the field was by a road where the Roman Catholic Church now stands and continuing on the left of the old Malt House, now known as St Augustine's Hall. "The old wooden pavilion, situated where the Cricket nets are now, had a small lawn in front of it, enclosed by an iron fence and only males were allowed to enter. There was a special enclosure for ladies in the centre of the willows bordering on the present playing fields by the stream, and on match days this enclosure was festooned with multi-coloured bunting. The boundary fence on the main road side of the ground ran in front of the position of the present Club House and connected with the hedge which now borders the Catholic property. The field between the cricket ground and the main road properties was often under water. The level piece of the cricket field immediately in front of the present Club House was used when not required for cricket, as a bowling green. Sometime between the end of the Boer War in 1901 and 1914 an English grass green with four rinks was laid behind the old pavilion (ie on what is now the 3rd team pitch) and was used continuously until the Council Bowling Green behind Basing House was constructed some time in the thirties. In the pre-1914 days the Club drew members chiefly from the professional classes, who had been coached either at a public school or a university, and multi-coloured blazers were disported by most at every cricket match. In 1919 the cricket field was again put into condition for play to be resumed, In early 1920 Salters Brewery was taken over by one of the large Brewery firms, and the threat of the Club losing the ground it had used for such a long time was very real. It was then that Mr Francis William Reckitt, an artist, who had lived in the town since 1904, stepped in and bought the whole property. He then had a modern club house erected as now, a hockey field laid out on what is now the 3td team pitches, replacing the bowling greens, and hard and grass lawn tennis courts constructed. The hard courts were where the car park is today and you can still see the brick built surrounds. Of course there were few cars in those days so no need for a car park. The Club now provided facilities for cricket, bowls, lawn tennis and hockey and when the club house was officially opened on 2nd February 1924, it then assumed the title of the Rickmansworth Cricket and Sports Club. The cricket club fielded only one team and played matches with high class opponents on Saturdays and Sundays. There was also a very efficient Wednesday XI. A cricket team functioned throughout the second world war of 1939-1945 and the cricket field was kept properly cut and the actual playing pitch of the hockey field was not allowed to grow wild. This was only possible because of an arrangement with the Hertfordshire County Council giving them sole use of the greater part of the club house as a children's nursery, and the financial arrangements made with the County during the war, and compensation when the war was ended enabled the Club to pay its way and accumulate a small surplus. Since the War the club started a steady decline from being a premier County side to, by the 1970's a club in a downward spiral. By the early 1980's the club house was altered to accomodate an upstairs changing room and the downstairs kitchen and garden, which had existed for the use of the club professional from the 1930's to the 1960's, was removed. Hence the serving hatch in the middle of the main hall. By the mid 1980's the club languished in the bottom division in Hertfordshire Cricket and the two Saturday and two Sunday teams was reduced to barely one team on each day. The Club considered a move to the Thames Valley League but decided to stay in the Hertfordshire set-up. In the 1990's the club started to attract new players again and won the 3rd Division and 2nd Division in successive years. The 2nd team were promoted also in 1995 and 1998. With costs being so high with such an old pavilion, the club was forced to rent out the ground floor and hall to a local fitness centre. Though it brought in much needed funds, the demands of running a Cricket Club were not always concommittal with a commercial enterprise. As Hockey has moved to an artificial surface elsewhere in Rickmansworth, the club now rents out the grounds in the winter to Chess Valley Rugby Club. 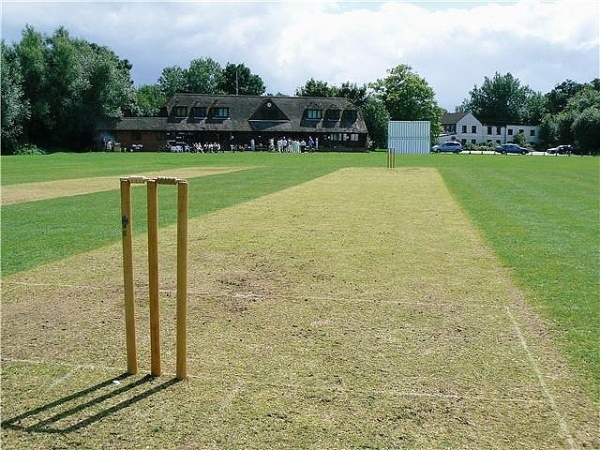 In 2012, the club celebrated its 225th anniverary and had four teams playing Hertfordshire League Cricket and 2 Sunday teams.